The BBC loves a good documentary series, and when it does it well, it really earns that licence fee, with thoughtful, lavishly-packaged hours full of insight and A-list talking heads. Tomorrow's Worlds: The Unearthly History of Science Fiction doesn’t disappoint. It’s an expansive look at the many worlds of Science Fiction - quite rightly recognised as a major part of modern popular culture, something that captures imaginations in the media, in technology, and in everyday life. 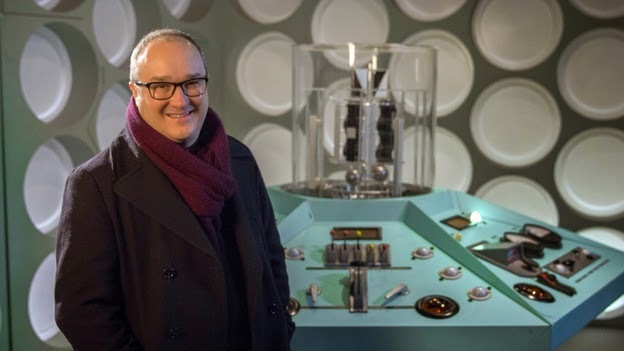 Ably fronted by historian and broadcaster Dominic Sandbrook, Tomorrow's Worlds takes a thematic approach to exploring Sci-Fi’s reach within popular culture. The first episode of four, Space, features Sandbrook exploring various depictions of mankind reaching for the stars through film, TV, and literature. Starting off with an obvious crowd-pleaser in Star Wars, Sandbrook uses this as a jumping-off point to examine a glut of takes on space exploration and colonisation such as 2001: A Space Odyssey, the impressionistic work of Georges Melies, Dark Star, Avatar, Alien, Star Trek, Battlestar Galactica, Ursula Le Guin’s The Left Hand of Darkness, Frank Herbert’s Dune and Kim Stanley Robinson's Mars Trilogy. The aforementioned Le Guin and Robinson offer insights here, as do a host of other luminaries including John Carpenter, Richard Dreyfuss, William Shatner, Nichelle Nichols, Anthony Daniels, Keir Dullea, Neil Gaiman, Edward James Olmos, and Ronald Moore. There are some familiar tales for the initiated. A glum George Lucas complains to Dreyfuss about wanting to make an art movie. Nichelle Nichols speaks of her experiences with Martin Luther King and NASA. Veronica Cartwright trots out her anecdote about her infamous reaction to the Alien chest-burster scene. But, we also get to see Anthony Daniels be surprisingly scathing about Star Wars, to hear Keir Dullea’s take on the surreal final scenes of 2001, and the thought-provoking argument that Gene Roddenberry’s utopian vision of the future shows a harmonious, integrated mankind free of war, disease, and debt - but, beneath these trappings, it’s a lot closer to Wagon Train and Bonanza than immediately meets the eye. Trek’s mankind is arguably an updated version of the frontiersman, moving from civilisation to civilisation and showing each in turn the error of their ways. Glen A. Larson’s Mormon faith informs his original vision of Battlestar Galactica. Very real fears about the price of progress and splits in society riddle the Mars Trilogy. This is all expertly teased out by Sandbrook, who is clearly in his element not only as a historian, but a fan of SF, as demonstrated by the lengthy conversation he shared with Reviews in Time and Space about the Doctor Who season finale over a drink afterwards. This first episode was premiered as part of BFI South Bank’s epic Days of Fear and Wonder season, and was followed by teaser clips from the remaining episodes: Invasion, Robots, and Time, variously touching on Doctor Who, Frankenstein, Blade Runner, and Quatermass. At the Q&A that followed, moderated by Samira Ahmed - Sandbrook and producers John Das and Ben Southwell spoke with great pride about the series, a co-production with BBC America. They revealed amongst other things, that the decision to split the episodes by theme was taken to avoid repetition - and showed some regret at not having a fifth episode to explore SF dystopias, and Sandbrook lamented the lack of space in the final cut for Blake’s 7. You may know a lot of the stories in Tomorrow's Worlds, and the stories behind the stories, but episode one of this series succeeds in telling them in a new and interesting way, and in its themed approach, it barely scratches the surface. Tomorrow's Worlds airs on BBC2 on November 22nd at 9:45pm. And so another run of well-acted, sumptuously designed and thrillingly unpredictable fantasy stories comes to an end until next spring as Game of Thrones signs off with a reliably strong final pair of episodes. There is a lot of ground to cover, and these instalments for the most part manage to get the job done. Some details perhaps are left out which certain viewers would have wanted, but information is readily available online on specialist websites and indeed the original books are as good a fantasy read as any. The show may come across as slower-paced in this season, particularly the second half, but a lot of game-changers have either cropped up or continue to play out, and long-term fans will be more than satisfied. The double-edged sword continues to be the notoriously huge roster of players - both major and minor; and yet an excuse to re-watch episodes time and again for clarification is one of the more enjoyable scenarios available in this digital age. ‘The Watchers on The Wall’ does work more overall as a singular episode, and tells a solid story with a beginning, a middle and an end. It benefits from being so focused on the small number of Nights Watch and Wildlings concerned, and gives their characters proper room to breath with substantial dialogue and thrilling action set pieces. There has been plenty of good material for Kit Harrington this season, even if the excursion that almost saw him meet Bran was effectively a frustrating red herring, with barely any impact on the overall storyline. This episode is instrumental in delivering a finish to the Jon/Ygritte story and pay offs to other threads that have dangled for at least a season if not longer. Sam Tarley goes from being a noble youngster with a bumbling nature to a noble man with some real backbone in him. Thus despite his overt fear, he shows true heart. This cannot be said of the rather slimy Janos Slynt who was shown up quite some time ago by Tyrion as a rather hubristic and sulky individual, with a rather warped sense of his own importance and gravitas. Even more detestable however is the Thenn leader - Styr - who has exuded pure evil since first emerging on screen at the start of Season Four. His threatening words towards Yygritte on the eve of battle, and barbarous methods towards enemies or defenceless victims mean that his demise - through Jon's improvisation with blacksmith's tools - is richly satisfying. 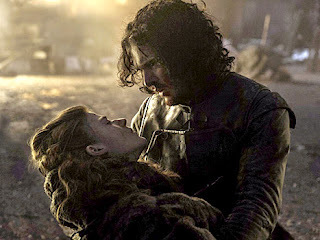 The resolution of the Jon/ Ygritte story is done quite well if somewhat requiring suspension of disbelief as the battle around them allows them to have their final moment. ‘You know nothing Jon Snow’ is one of the great quotes of the saga and surely will resonate in Jon’s head for a fair amount of time to come. The original death of Ygritte was rather vague, so the show really does well to involve a fatal arrow shot by the young boy orphaned in the Wildling attack on an exposed village (from 'Breaker of Chains'). The survival of Torbund - such a wonderfully written and acted character is very welcome as he may have a political role to play even if his humour and hobbies in life are on the primitive side. Not all fan favorites get let off so lightly; with some rather shocking deaths for Pyp and Grenn that would not be expected by book readers who have 'read ahead' of the show's timeline. Nonetheless the set pieces, music, mood and all the little showcases of the show's hefty budget are wielded effectively to ensure that this is a fine companion piece to ‘Blackwater’ by returning director Neil Marshall. 'The Children' is ever so slightly inferior on its own terms due to several areas not being quite up to full potential. But it is still by far the best closing episode to a season, with the other three being mere codas which just laid things in readiness for the next year. Stannis moving up North to settle the current battle between the Wildlngs and the flagging forces of Jon Snow is very welcome (and perhaps overdue) after all his skulking back at Dragonstone for the majority of two seasons. His 'divinely regal' arrogance versus Mance’s more down-to-earth form of pride is one of the better clashes of the series. It involves some intense body language with actors Stephan Dillane and Ciarán Hinds showing utterly excellent acting craft. Furthermore having Mance back on screen after such a substantial absence is very pleasing, and probably crucial for this story-line now that other key players have bit the dust. So the Hound and Arya arc has operated splendidly as an intriguing sub-plot going back to Season 3 (and arguably back to the scene where she mourned the death of her friend Mycah). Clegane's stubbornness in not getting his wound treated has led to him becoming a shadow of the fearsome fighter he had been known as. When Brienne fails to persuade him of her credentials concerning Catelyn's wish for her children to be returned, there ensues a fight to the death. And this amazingly strong woman who has been ridiculed by so many men similar to the Hound gets to stand up and walk away when all is said and done. This unlikely union had to end eventually, and despite the Hound's amoral/immoral nature, we feel real pity for him as he writhes in agony on a jagged boulder. And Arya probably feels the same way too. The look both the performers give one another is utterly spellbinding and I will miss Rory McCann as much as any regular actor who no longer participates. However the lack of a truly conclusive onscreen death leaves a glimmer of hope; were we to follow the logic that GRR Martin himself maintains. The eventual escape of Arya to Braavos is well done and a very fine closing scene to the season. Maisie Williams is just so wonderfully natural and compelling as Arya and it scarcely seems credible that a single viewer can be indifferent to where this character's journey will take her, both literally and psychologically. Having last seen their tribulations in the middle section of this season, we finally catch up with Bran's party as they locate the mystical tree which was hidden to most who brave the cruel regions North of the Wall. Despite seemingly getting some reward for their long struggles, there is a major twist in the tale that sees Jojen Reed perish. Rather grimly it was something he actually accepted all along, such were his clairvoyant powers. His sister Meera is seconds away from perishing as well, but manages to get to the safety of the heart tree with the others. And once again Bran's ferocity through the use of Hodor as his warg host is plain for all to see. A huge game changer appears as the crippled Stark boy now knows where his powers will take him next. We are all left to wonder just where this arc will go now, given the re-arrangement and new material that has distinguished Season Four. Any review of Game of Thrones must however be mindful of the many intrigues taking place at King's Landing. When last we saw Tyrion it appeared he was but a hair's breath away from execution. Fortunately he has been allowed a little time left for an unlikely act of rescue. Jaime is the savior that we all anticipated - letting his brother out at great personal risk to himself. Rather less logically - for both long-term fans and for book readers - is the crucial aspect of Tysha being retconned out of this sequence. Originally there was a major revelation that she really was in love with Tyrion, and Tywin had manipulated the whole situation. That is to say that the dwarf's first wife was apparently a simple whore - bribed to make Tyrion experience intimacy with a woman for the first time. This would then be more than enough reason for the vicious actions that we end up witnessing, from the condemned 'murderer' of Cersei's son. What instead transpires is a simple conversation where Tyrion is led to the route of safety - with Varys being the man to help him escape King's Landing safely by boat. Thus Jaime and Tyrion seem to remain on good terms and there is less obvious reason for the pragmatic dwarf to go into the 'lions' den' of the Tower of the Hand. 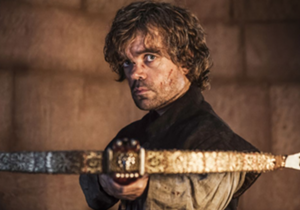 Given the dramatic events that took place with Tyrion's courtroom trial, and his narrow loss in the trial by combat, there is some motivation to a small extent for him to seek out his father. Before that critical event can happen, Tyrion first discovers the worst thing possible: his former girlfriend Shae is now lying in bed waiting for Tywin to rejoin her. She realises he will try and kill her and takes action to finish him first. Tyrion is too quick a thinker though and uses the chain-necklace round her neck as a makeshift weapon to strangle her. Rather more conventionally, he chases down his cruel father with a crossbow to hand. Although Tywin is still an able enough warrior and would have a very strong chance against Tyrion in a neutral situation, he is utterly exposed and defenceless when Tyrion finds him on the privy(!). This final sequence where father and son spew venom at one another, after Tywin feebly tries to suggest that there would be no execution for any Lannister is reasonably well-done, but could have been so much better. Dinklage and Dance both seem fine, but the intangibles that make the show really sizzle at times are curiously lacking. Nonetheless the ignominious death of Tywin Lannister is a pivotal moment in the show and will not be forgotten. There is thankfully some good pay off from the Tyrion and Varys conversations that occurred in Seasons 2 and 3. It feels absolutely right that these two misfits should depart for pastures new across the Narrow Sea. A rather uncertain and dangerous path awaits; regardless of the inevitable vengeance of Queen Regent Cersei. And what of one of the shows' principal leads - Emilia Clake - and Daenerys' situation in Meereen? I will not add anything new to earlier comments of mine making out that these events are not exactly the hottest ticket in town. Yet with the departure of Ser Jorah Mormont and her frantic responsibility to now harness her three dragons – the fiercest of which has decisively evaded her clutches - she is not having an easy time of it in maintaining her rule of the slaver cities. The stylishly shot sequence where she chains her dragons so that they are confined to a cave with no light is however one of the most memorable moments of the show thus far. Dany's story has tenuously connected with other material but without giving too much away, Season Five should find a way to make events dramatically more relevant. Perhaps also we will find Emilie Clarke in better form again as she certainly has the screen presence, if not the range of some other principles, when everything is clicking around her. So this season has been and gone some months now, and yet it is still all too long a wait for the next batch, as winter is coming for us in the real world. I had hoped that the 2014 sequence of the show would be the best yet, and it certainly is at least the match of last year's. There is a lot of consistently good elements - although Season 3 did have an utterly riveting twist in the form of The Red Wedding. The show is confident with various actors that have grown into their roles, and it has established its own path and voice now. Upcoming episodes now have the challenge of finding the best bits from the later books and getting a quite dense plot to make sense. This show must have looked almost impossible to pull off at one stage not so long ago, but is now a true global phenomenon and deserves every accolade it gets and more.